"Honey, where's my super suit?!" 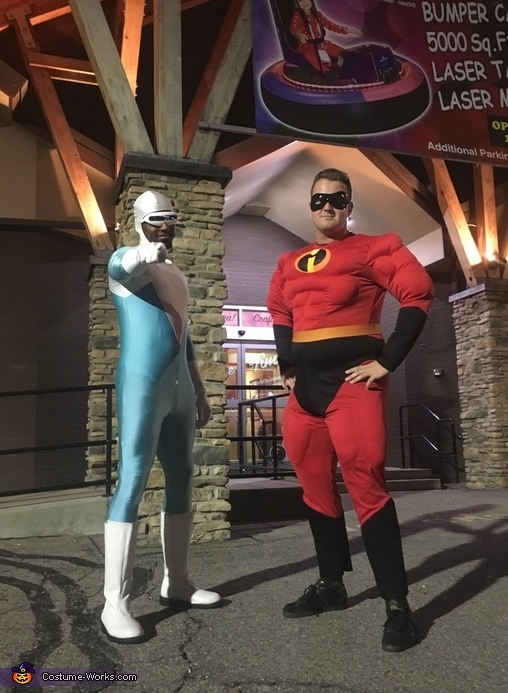 This past Halloween, I dressed as Frozone and my friend Armen is dressed as Mr. Incredible. We got the idea for these costumes after watching a clip* from The Incredibles movie where Bob Parr (Mr. Incredible) and Lucius Best (Frozone) are sitting in their car contemplating whether they should go should stop a bank robbery or go bowling like they told their wives they were going to do. We actually did go bowling on Halloween night wearing the costumes and captioned our picture, "Tonight we actually did what our wives think we are doing... "
We got the pieces for these costumes from various retailers. Specifically, Mr. Incredible's facemask was shaped out of black plastic and held in place with a string.